Sisal rugs are eco friendly and represent excellent value for money, our sisal range features a cotton border which is available in seven different colours. Sisal is a natural fibre found all over the world, this makes sisal rugs green & environmental friendly . Sisal is strong and hard wearing and is ideal for rugs / carpets. 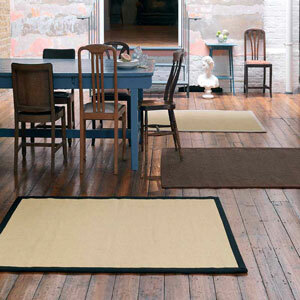 Our Sisal collection has an anti slip latex backing and a cotton border. Sisal rugs are ideal for Kitchens, Conservatories, Porches and entrances.